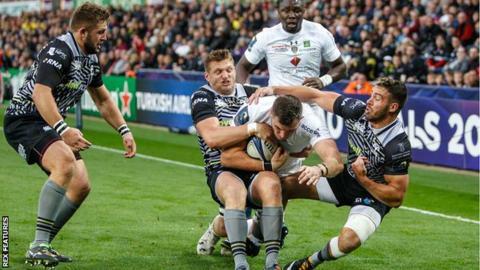 Clermont Auvergne's pace and power proved too much for Ospreys as they were beaten in their Champions Cup opener at the Liberty Stadium. A difficult period for Steve Tandy's side rarely looked likely to end against the Top 14 side despite Ospreys mounting a late comeback. Dan Evans scored twice and Rhys Webb also crossed but Morgan Parra's kicking in his 200th game was the difference. Wales back-row Dan Baker and scrum-half Rhys Webb were also both injured. Baker suffered what appeared to be a serious injury while Webb hobbled off late on and will be a worry for Wales coach Warrens Gatland with the autumn internationals looming. Ospreys trailed after just four minutes in front of watching Gatland and it came via a score that illustrated the size of the challenge they were facing. An Evans kick was quickly returned and Alivereti Raka - fit again after a heel injury - surged through the Ospreys' defence, carrying wing Keelan Giles over the line with him as the Welsh side failed to stop his sheer power. Parra converted, and another powerful Clermont score followed within the opening 10 minutes. This time Parra was the provider as he fed Camille Lopez who found space and time to pick out Scott Spedding, who crossed under the posts to give Parra an easy job of doubling the advantage to 14-0. Giles thought he had reduced the arrears when he crossed after 15 minutes, but the try was disallowed owing to Kieron Fonotia clearly blocking Remi Lamerat. However, Ospreys' Toulon-bound scrum-half Rhys Webb, recovered from a calf problem, gave the home fans a reason to be cheerful when he crossed under the posts. Dan Biggar was able to convert, but Ospreys could not make further inroads into the scoreline as a result of the excellence of Parra and his boot as he slotted over two penalties from 40 metres to bring the score to 20-7. Baker was one of five changes from the 18-19 loss to Scarlets in the Pro14 but arguably Ospreys' most impressive player was withdrawn on a stretcher just past the half-hour mark after landing awkwardly in a tackle. Tipuric certainly helped to pick up the slack, driving his side on after the interval in an eye-catching display. Another confident penalty from Parra extended the Clermont lead to 23-7 but the Ospreys improved after the interval and might already have scored when Evans crossed on the hour mark. Biggar added the extras and with it passed the 500-point mark in European competition, becoming the third Welshman to do so after Stephen Jones and Neil Jenkins, to give the Ospreys renewed hope at 23-14. However, it was to be a first home defeat to a French side in 13 years despite Evans springing through for a second try after a nice sidestep and pass from Owen Watkin, with Biggar again adding the extras. A monster penalty from Spedding settled matters and the only consolation for Tandy's side was that Evans' brace of tries at least ensured a losing bonus point. Clermont prop Aaron Jarvis told BBC Sport Wales: "It was always going to be hard, Ospreys are much better than they have been showing in the league. "We are happy to get the win. We just about held on at the end, we are on the right track. "There is nothing better than beating your old team-mates, so this was good. I am enjoying it in France, it is a very nice lifestyle." Ospreys coach Steve Tandy told BBC Sport Wales: "We gifted Clermont some early points with a lacklustre 10 minutes. "After that we were positive and had numerous opportunities against a top-end team... but ultimately it has ended in disappointment for us. "It is fine margins. We lost to Scarlets by a point.. the rub of the green doesn't seem to be going our way, there are some big moments we've been on the wrong side of." Ospreys: Dan Evans; Keelan Giles, Kieron Fonotia, Owen Watkin, Cory Allen; Dan Biggar, Rhys Webb; Nicky Smith, Scott Otten, Dmitri Arhip, Bradley Davies, Alun Wyn Jones (capt), Dan Lydiate, Justin Tipuric, Dan Baker. Replacements: Sam Parry, Paul James, Ma'afu Fia, Lloyd Ashley, Olly Cracknell, Tom Habberfield, Sam Davies, James Hook.